In honor of the holiday, I'm posting a free short story. 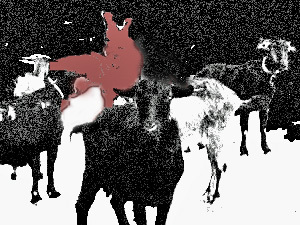 The monster in this tale, "The Goat Herd", is the legendary chupacabras. Note, January 2013: The complete story is now available in New Mexico Fairytales. This blog post contains Chapters 1, 2 &3, original draft. The chupacabras eats goats...or human souls. Sometimes it eats both. And on a night like tonight, there's no telling where the monster will hunt for its prey. Maybe your house. Whatever you do, don't look back. It encourages them to hunt you. This is a work of fiction. Names, characters, places, and incidents either are the product of the author’s imagination or are used fictitiously, and any resemblance to any persons living, dead, or undead, or to any business establishments, events, or locales is entirely coincidental. THE GOAT HERD, a short story. This story is protected under the copyright laws of the United States of America. Any reproduction or other unauthorized use of the material or artwork herein is prohibited without the express written permission of the author. Dedicated to the seekers and the shepherds of this desert land. In the desert land, a place where relief from sun and wind lay hidden from human eyes, an old man walked with his goats. The goats wandered around the trail, pulling at the stubby grass with their firm teeth. They waggled their tails and shook their heads against the breeze. Some of the younger ones touched heads, pushing with their growing horns to see who was stronger. The land was silent but for the occasional bleat of one goat calling to another. Twisted and bent, his torn cloak colored like the desiccated soil around him, the old man blended into the landscape. He leaned against a carved wood staff as he walked. His face, lined by the years and the sun, seemed oddly youthful as he stared at the goats. It was a trick of dust and light. The desert had veiled his age by covering his skin with an even coat of dirt. Once the old man moved again and began to sweat, the dirt would cake into his lines and make him look older than before. Even the old man did not know his true age. Years had no meaning. The old man whistled to the goats. The gap between his front teeth made it simple, almost too easy, to send a shrill sound across the desert plain. He'd learn to modulate the sound. His whistle was soft and comforting. The goats came quickly, drawn by the promise of security. Only the white goat lagged behind. The old man saw, and frowned. He loved this goat. He loved them all, but the white goat was a special joy. She mothered the other goats, coaxed them along when the trail was steep, and pushed them away from danger. If the old man had a partner in herding, it was the white goat. When she stopped on the trail and looked back over her shoulder, the old man wondered why. He walked around the goat herd, pushing them into a tight group. Then he turned to the white goat. For days, the old man had sensed the presence of evil stalking the herd. It kept far back, the evil, but it never left their trail. Whenever the wind shifted and the old man smelled the dark one, his heart seized with fear and he hurried the goats along. Yesterday, the old man had come across the carcass of a dead goat. He'd pushed it quickly off the trail, before his own herd had seen it. But even in his haste he'd seen the three puncture marks on the goat's throat. Something had drained the animal of blood. “We must reach Haven. We must hurry for the mountains,” the old man urged. The white goat made a noise deep in her throat, a quiet call. She looked into the bushes to the right. Her tail twitched happily. “What is this,” wondered the old man. He looked from the goat to the bushes. Tentatively he stepped forward, and poked at the brush with the end of his staff. From out of the gray mesquite popped a pair of stubby horns. A brown head with a black stripe emerged. The little brown goat jumped out of the bushes. He looked around quickly. The white goat's familiar form appealed to him. He bleated to her, and she answered. The brown goat hurried to the white goat's side. The old man followed, and carefully inspected the brown goat. He had never seen it before. The black stripe running down the center of the goat's head and partway down the neck was distinctive. The old man had never seen it among his goats, or the other herds he knew in the area. The brown goat looked up at the sound of the man's voice. The old man rubbed the goat's head between the stubby horns, and the goat sighed with pleasure. “Then it is agreed. You come with us to the Haven,” announced the old man. The white goat butted the brown one gently with her horns, directing him to the rest of the herd. The old man smiled and nodded. “Onward,” he said to the herd. He led the goats up a small rise and halted them at the top. In the valley below rested a small city, splayed out on either side of the highway. Mountains rose in the distance, milky brown against the sky's cerulean blue. The old man pointed with his staff to a place near the highway. Pulling his cloak tighter around him, the old man checked the sky. A few clouds gathered in the distance. The old man lead the way down the path. As usual, the white goat brought up the rear. The little brown goat dashed around the rest. He stayed close, but kept wandering off the path. It would take time for him to learn his place in the herd. The white goat stopped suddenly, and glanced back. The old man did the same. With a loud bleat, the white goat charged forward. She found the little brown goat and knocked him back into the herd. He looked at her with startled eyes. The white goat butted him again. She pushed him to the front of the herd, and kept him there, blocking him each time he tried to wander away. Now the white goat led the herd, and the old man brought up the rear. Between them moved the goats, happy and bleating. Occasionally, one paused to grab a mouthful of grass. But the closer they came to the city, the less there was too eat, and the faster the old man made them move. They passed under the highway. The walls around them, rough and sandstone beige, threw back the sounds of cars rushing past. The heavier traffic of the highway rumbled overhead. It confused the goats. They thought it was the thunder that came with rain, and if there were a storm, that meant they should stay under shelter. But the old man pressed them on. The goats trotted. The herd emerged from the overpass into a bowl area of dirt and sparse grass. A highway off ramp curved around them. The goats ignored the cars, intent on the grass they could find. And the cars ignored the goats. The animals and the goatherd were mere landscape, timeless relics in a place where travels set their watches by miles traveled under the sun. Had the goats and people in the cars locked eyes, they would have seen nothing. The old man let the goats feed, but only for a moment. He felt evil drawing closer. I cannot face it here, the old man thought. The dark one will use the city against me. There are too many footholds for the creature in this place. We must pass through the city to the mountains. They waited for a break in traffic then hurried across the road. The old man directed them behind a strip mall. The goats sniffed the air eagerly and wagged their tails with glee. Their path held delectable bits of garbage, crushed paper cups and forgotten food wrappers. “No,” the old man said. He struck the ground with his staff. The goats jumped, and left the garbage alone. The little brown goat behaved well, until they passed a dumpster in the middle of the alley. He stopped and smelled the air. Then he planted his front hooves on the side of the dumpster, and pushed himself up so he could see through the opening on the side. The white goat bleated with dismay. The old man stepped around a blue car parked in the alley, walked to the dumpster, and scooped up the brown goat with one hand. He tucked the little animal under his arm. “Not for you, cabrito. If it were up to me, you would never know that thing was there at all,” said the old man. Soon they passed through the last tendril of civilization. The white goat sighed with relief. The old man set the brown goat beside her, and the white goat crooked her head over the brown goat's neck. The old man could not share their comfort. Fear for the goats gnawed at him. He scaled a small outcropping of rock and looked back, across the city. Something dark moved in the distance. It slunk towards the city with calm knowledge of the path. Sun glistened off its coarse fur, making the animal shine. Cristiano laughed into the phone. He cast an admiring glance over his black and turquoise flame stitched boots, the new ones with the ostrich leather toes. The blue-green turquoise matched perfectly with his shirt, and Cristiano knew it. Everything matched and everything was perfect, because he paid to make it that way. Cristiano hung up, muttering to himself in Spanish. He looked up and saw a man standing in the doorway of his office. The man was young, but with tired eyes and thinning hair. The thin hair he disguised by using pushing volume underneath and slicking it back, giving particular attention to the middle where it ran thick and black from forehead to neck. The fatigue in his eyes could never be hidden or diguised. Cristiano opened a drawer in the metal desk. The desk was old, and the drawer stuck, so he had to tug. “You going to Texas?” Cristiano asked. He extracted the bottle from the stuck drawer and took a swig. Mario didn't answer. He took the sheet of paper Cristiano offered. Without looking at it, he folded the sheet in quarters and shoved it in the inner pocket of his leather jacket. Cristiano laughed. “You aren't even going to look?” Cristiano asked. “I had a girlfriend. I don't anymore,” Mario said quietly. “That would be more acceptable. It wouldn't be so...” Mario paused, searching for the words. “Que raro,” he said at last. Cristiano's eyes narrowed to reptilian slits. Mario frowned and shook his head. “You're the best, Mario. My favorite coyote,” Cristiano called after him. Coyote. Mario thought about the word as he walked to his car. In the past, the word had only one meaning. It was the name given to the canine creature that loped across the deserts and plains, feeding on rabbits and the weak animals of large herds. Recently it had come to mean a middleman, a fixer who took on illegal jobs. Most coyotes were border smugglers. They helped Mexicans sneak into the United States, and sometimes helped them find housing and jobs. Most coyotes were paid a flat fee by the smuggled or the smugglers family. Some took fees from both. Others waited until the smuggled began work in the US, and took a cut of the pay from the job. If Mario was a coyote, he was the newest sub-species. Mario drove people back and forth between the states of Texas and New Mexico. There were no border crossing guards to sneak past. The closest thing to a border crossing building was a tourist information center near Glen Rio, Texas. Mario stopped there once, and the nice women who worked their gave him free coffee. The element of danger that came from passing guards with loaded weapons, just wasn't there. Of course, what he did was still illegal, and Mario would be arrested if he was ever caught. But who would catch him? The crime was so complex, Mario could barely understand it. It would take police a long time to unravel the mess of things the medical clinic did, and until that happened, Mario was safe. The medical clinic that employed Cristiano and Mario was a sham. Yes, doctors and nurses worked there, but they rarely treated local people from the town. Their focus was benefit fraud. They performed procedures on the patients Mario and other coyotes pulled in from Texas; colonoscopies, circumcisions, septoplasties to straighten the insides of noses, and other minor surgeries. The clinic didn't charge the patients, but they billed the patients' benefit companies an arm and a leg. From what Cristiano said, the clinic marked up the costs of each procedure as much as two thousand percent. Cristiano chose the patients. He drove through low income neighborhoods and hung out outside factories and warehouses, hunting people who knew little English and would be eager to make some quick cash. Once he confirmed the prospective patient had some form of medical benefits – insurance, Medicare, Medicaid – Cristiano would pass the name to Mario or another coyote. So far, the insurance companies and the government hadn't caught on. Either they didn't know how much the procedures really cost, or they were so busy processing claims they didn't take time to analyze anything. Mario didn't know, and didn't care. Mario delivered patients to the clinic. He picked them up in Texas and drove them to New Mexico. On the way, he coached them in what symptoms they should complain about to the clinic staff. Then he got the patient checked into a motel near the clinic, and bought them dinner. The next day, after the medical procedure was complete, Mario would pick up the patient for the drive back to Texas. He paid the patient a few hundred dollars in cash then drove away. At the end of the week, Mario collected his pay – a price per head he delivered, plus expenses. Compared to when he'd run drugs, this new job was easy; no one shot at him. And as Cristiano said, they were helping people. Mario brought people to doctors who performed needed procedures, and the only ones who got hurt in the end were the big insurance companies. Cristiano was right; Mario's girlfriend didn't understand the good he did. This new job was much better than drug running. Mario pulled out his car keys and reached for the door of his worn but serviceable Ford. A pungent smell struck his nose, and he paused. He'd grown used to the strong stench of decay coming from the clinic's dumpster. That scent remained, but something newer and stronger floated over it. The alley smelled like...goats. Mario looked around and noted a few piles of goat droppings scattered around the pavement. Goats were not unwelcome in his world. Mario's family in Mexico raised goats, until the drug cartel came in and took possession of the ranch. He kind of missed the smell. Mario unlocked his car and climbed in, thinking of home. The uneventful drive back to Texas gave Mario plenty of time to reminisce. He thought about his parents, their laughter and love for dancing. He recalled his sister Maria's soft smile. But mostly he dwelled on the memory of this grandmother. She waited everyday for him to come home from school, and folded her strong arms around him the moment he walked through the door. He recalled her sure hands flattening tortillas, the smell of chiles and cinnamon filling the air. Then he remembered her still hands on the ground, palms up, as her body swelled in the sun. His sister Maria's crumpled form. His mother's tears, as she cradled the body of his father. Another family taken, because they sided with the wrong gang in the war. But Mario showed them. He joined the local gang, and avenged his family. Then he moved to the gang's drug trade branch in the US. He'd be with them still, but the drug team dropped him after his second arrest. Good thing Cristiano came along when he did. Across the border, near Adrian, Texas, Mario began to fell hungry. It was dark out, and well past dinner time. Normally Mario would stop in Adrian to visit the Midpoint Cafe. He felt so American there, eating a hamburger and pie. The Cafe was a landmark on historic Route 66, and attracted tourists from around the world. So most times when Mario entered the cafe, he wasn't the only foreigner. He was often the least foreign one in the room. Tonight when Mario drove up to the cafe, he saw it was closed. He glanced at his watch. Eleven o'clock. He should have realized the cafe wouldn't be open. Somehow, being a coyote effected his perception of time. He thought more about the miles he drove and the fuel he burned, than how much time passed. Clearly if he wanted to eat, he'd have to wait until he reached a larger town or a city. Mario decided to check his destination. He pulled out the folded paper, and read it by the light of lamp outside the cafe. The patient, Teresa, lived in Amarillo. That was just fifty miles away, and large enough to offer plenty of late night eating options. He'd catch a meal there. As Mario backed out of the parking lot, a dark shape dashed past his car. Mario caught a brief glimpse of the creature as it crossed his headlights, a vision of slick reptilian skin and sharp spines. He slammed on the breaks and looked around. Then he turned off the engine, and rolled down the window. It was very quiet. In the distance, cars rushed along the interstate. Crickets chirped in the dry grasses at the parking lot's edge. Mario expected those sounds; he listened for something more. After a moment, he heard it. The faint sound of labored breathing seeped out from the shadows. Mario fumbled around the floor of the car until he found the flashlight. He pointed the light at the breathing noise and turned it on. Two points of green light, night eyes of a predator, glowed for a moment then disappeared. As a child, he had learned to fear the chupacabras. The monster targeted livestock. It sucked the animals dry, pulling out their blood and organs through punctures on their necks. The monster loved the taste of goats. The name, chupacabras, literally translated as goat-sucker. Mario, his sister, and his entire family, feared what the monster could do to the family's livelihood. The chupacabras didn't attack his family's goats, but a neighbor's herd was destroyed over a period of two nights. Mario's father stood watch the second night. He tried to protect the neighbor's goats, but the monster was clever. Whatever direction the man faced, the monster stood behind him. Mario's father would hear a noise, turn, and find another goat dead on the ground. Finally, Mario's father herded all the goats to one spot. He corralled them in with a make-shift pen of rope and wood stakes. Then he placed a cross on the ground behind him, to ward the monster away. Mario's father stood tall, facing the goat herd. He blinked once, and the goats were there. He blinked again, and the goats were gone; the cross lay before him. Mario's father whirled around. There were the goats, caught in their pen. They bleated and howled in terror. Mario's father ran to the fire. He grabbed a burning stick by the cool end, and pointed the torch at the herd. At the far side of the pen, slinking in shadow, he saw a beast. The chupacabras stood higher than a coyote, but lowered its head and curved its spine like the desert predator would. The light of the torch reflected off its dark, course fur. The hair on the monster's back grew thick and tall, like spikes. The chupacabras looked at Mario's father. Its eyes glowed green in the firelight. Mario's father dropped the torch and fumbled for his gun. He raised the weapon and pointed it at the chupacabras. But the monster had moved; it wasn't at the back of the goatherd anymore. The thing stood directly in front of him. That was how he always finished telling the story. Mario knew there was more. His father, terrified by what he saw, dropped his gun and ran. He arrived at the family ranch, and ordered everyone to bring the goats into the house. For the next ten days they lived with the goats, keeping them inside until the chupacabras moved on to another part of the country. Initially they kept the goats in the courtyard, but the animals could hear the chupacabras on the other side of the wall, and they panicked. So, they moved the goats into the house. They didn't lose a single goat; the neighbor lost many. And Mario's father, being the man he was, gave two of his best breeding pairs to the neighbor. It was the right thing to do, because he ran. But Mario's father never finished the story of the chupacabras by talking about his own fear, or the way the family kept their own goats safe. He always finished by talking about the monster's eyes. Mario wanted to see those eyes, wanted to look into then himself and know the thing a brave man feared. Mario threw open his car door and hurried to the spot where he'd seen the reflective flash of green from the monster's eyes. He shone the flashlight all around. Six footprints, shaped like a large coyote's stretched out in a line before him. The footprints set deep in the ground. Mario followed them until the trail disappeared. Then he gave up, and turned around. As Mario's flashlight played across the cafe wall before him, he two flashes of green. Mario shouted and ran forward. He stopped, confused. There was nothing in front of him but the cafe. There was no animal at all. Now I imagine things, Mario thought. Perhaps I imagined everything. He walked back to his car, and tossed the flashlight inside. As Mario dropped into his seat, he happened to glance at the ground beside his car. Four footprints, newly formed, rested in the gravel and dust. They pointed at Mario's car. The hairs on the back of Mario's neck stood up, and he shivered. He knew he was being watched; he could feel it. And he knew that if he raised his head up just a little, he would see the eyes of the chupacabras staring back at him. Bile rose up in Mario's throat. He slammed the car door, turned the ignition, and peeled out of the parking lot. Something outside the car shrieked as he left. Mario sped along the choppy road through Adrian until he reached the interstate, then he floored it. He didn't slow down until he reached Amarillo. When he stepped out of the car outside the truck stop, Mario happened to place a hand on the outside of the car. He felt a deep gouge cutting through the paint and metal. Mario stared at the car. Down the length of the driver's side ran four scratches, like claw marks from a monster. The old man studied the brown goat with concern. A day had passed, and the cabrito showed no sign of settling into the herd. When the other goats stopped for water and food, the brown goat held back. He stared behind, constantly looking at the trail already traveled. The old man didn't know what to do to help the cabrito. It seemed the white goat didn't know either. She nuzzled the brown goat at every opportunity, and bleated mournfully when it was time to eat and he turned away. When the cabrito did eat, she stood guard over him. Still, she worried, and looked to the old man with pleading eyes. For his part, the brown goat seemed unaware the white goat or the old man were there. He acted like he didn't hear them. He didn't respond to the white goat's caresses. When he looked at them, or any of the other goats, he stared right through them. The only time his eyes focused and shone were when he looked back. And the chupacabras drew closer. The old man saw it every time he looked back. The creature followed them, night and day. The old man almost wished the monster would hurry. This slow lope behind the herd maddened, reminding the old man of the inevitable conflict to come but delaying it hour upon hour. Then the old man realized he wasn't the only one watching for evil. The brown goat watched too. In fact, the cabrito wasn't looking at the path at all; he watched for the evil that stalked them. He watched eagerly. In that moment, the old man feared for the brown goat's life. The brown goat turned his head and looked at the old man. He glanced back down the path, and shivered. With a startled bleat, the brown goat hurried back to the herd. He sought out the white goat and huddled against her. He stood up and watched the chupacabras weave its way around a rocky outcropping. The fight would come, some hour, some day. They must be ready. Thank you to Maribel Martinez, for giving me an honest opinion and checking my Spanish. © Copyright 2010 - 2018. All rights reserved. All images and content are copyrighted material, property of the writer, and may not be used in any manner without prior written permission.